A walk down the high street suggest the Back to School offers are coming thick and fast, which got us thinking about back to school knits. 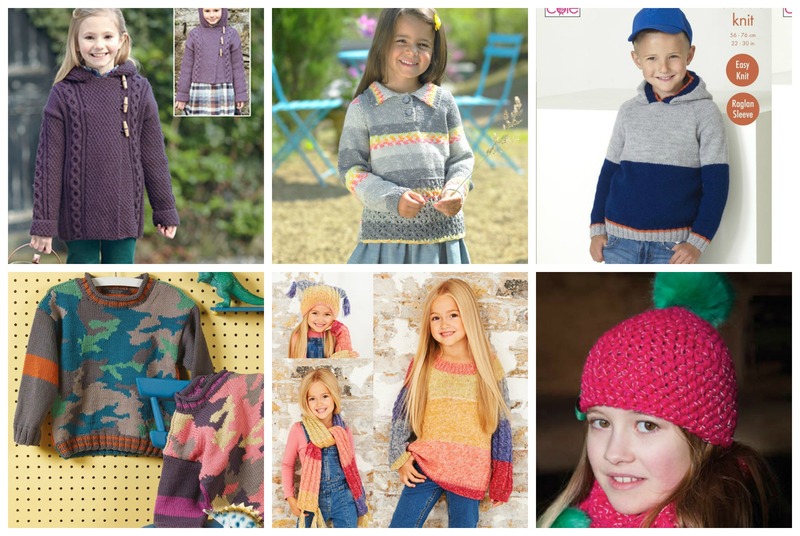 We know that lots of children wear school uniforms, but outside school they will still need practical, trendy knitwear going into the autumn, so we have taken a look at the children’s clothes trends for autumn and picked out a few pattern to get you started. Hoodies aren’t just practical options, they are a popular kid’s trend. We like the cable duffle coat and the colourblock hoodie because they combine hoods with the trends for textured knits and stripes. The sweater scarf and hat set also combines colourful stripes with less solid dye effect – mottled, marl and tweedy looks are also on the autumn winter trend list. Fair isle and print looks are set to be popular so you could take on some interesting colourwork like the cotton sweater or cheat slightly by choosing a yarn that creates a faux fair isle effect as shown above. Accessories are also a kid’s essential in autumn winter – especially a bobble hat or two. And they are a good knitting and crochet choice while the weather is still warm. However, we picked this one out because of the yarn which features reflective fibres. A great choice for adding safety to kid’s knits.